Software lifecycle and content management developer Telerik this week offered something very new and very different: Test Studio for iOS, the App Store's first mobile testing tool for iOS applications. Test Studio for iOS is a free app available from the Apple App Store that lets developers test native iOS apps as well as hybrid and Web apps. 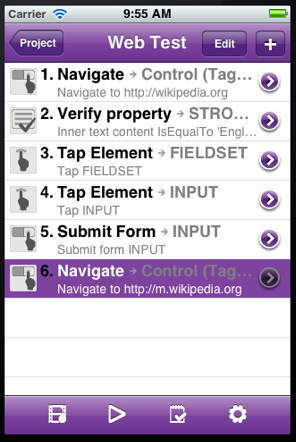 The tool can test common iOS controls and record test scripts for gestures such as taps, multiple finger gestures such as zooms, swipes and taps. I spoke to Christopher Eyhorn, Telerik executive vice president of Testing Tools about the app and took a demo. He said that unlike some other testing tools Test Studio doesn't require users to jailbreak or modify their testing devices. In addition, the testing is object-based and doesn't use image captures. Instead, its test steps are based on Element Locaters, which will ensure that the correct element is targeted when tests playback. To expose the elements in native iOS apps, developers will need to download a small library component to recompile with their code, Eyhorn said. The app supports MonoTouch, PhoneGap and Xcode IDEs, the company said. In a demo, Eyhorn recorded a test script for an app and saved the results. Of course, a series of these results can be saved for analysis and checking regression. When recording, the active area of the screen is surrounded in a red band and the active screen element is highlighted in red. Straightforward. What was very interesting to me about Test Studio was the "Ad-hoc testing," which lets testers manually walk through the app. Testers can record feedback on the fly about bugs or the user interface, and then automatically send the feedback directly to the development team or another email address. Very nice. When recording a script, Test Studio for iOS shows a red line around active elements. I admit that I'm a sucker for software demonstrations, but Test Studio for iOS looks like the real deal. 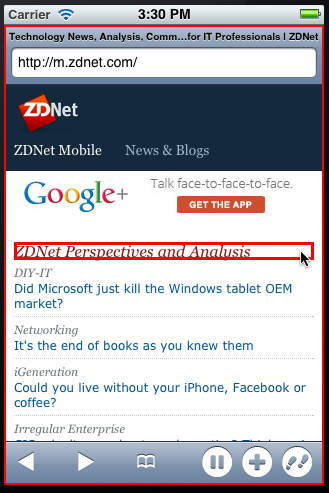 In addition, it can also be used to verify the elements and properties in a web application or a mobile web site (we looked at ZDNet's mobile site). I found the app straightforward and understandable, something that could be deployed to a wide and not-necessarily sophisticated group of beta testers. QA is something very important to the acceptance of an app and Test Studio can certainly help that process and increase the effectiveness of beta testers. Eyhorn said the means to sync test results and deploy results in a real source repository was coming soon.